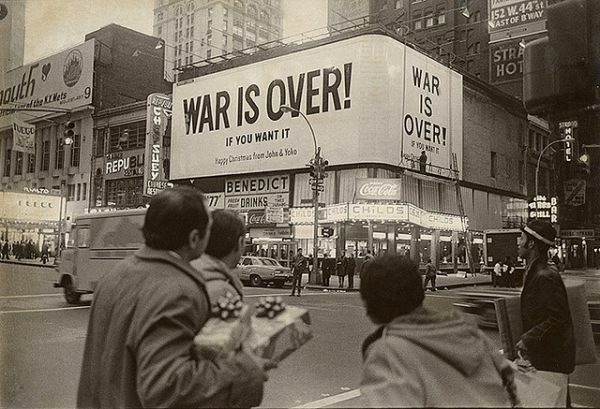 In 1969, John Lennon and his wife Yoko Ono had giant poster-billboards put up around the world in various major cities featuring the inscription (in black letters on a stark white background) “War is over! If you want it. Happy Xmas from John and Yoko.” The posters appeared in Paris, London, Hollywood, Athens, Tokyo, Berlin, Rome, and Toronto. Perhaps most pointedly, one also appeared in Times Square, New York, directly across the street from a Marine recruiting center. This was right in the heart of the most political phase of Lennon’s fascinating career (the late ’60s and early ’70s). The John and Yoko song, called “Happy Xmas (War is Over),” was recorded at the Record Plant in New York City over October 28th and 29th in 1971. The song was produced by John’s old friend Phil Spector. It featured four guitarists: Hugh McCracken, Stuart Scharf, Chris Osborn, and Teddy Irwin. Famed bassist Klaus Voorman was scheduled to play, but his plane was delayed on the day of recording and an unknown player filled in for him. Nicky Hopkins played “keyboards, chimes, and glockenspiel” along with Yoko. Jim Keltner played drums. The Harlem Community Choir (30 kids strong) sang the chorus. When the song was released, it was credited to John & Yoko/Plastic Ono Band with the Harlem Community Choir. The song begins with whispers: Yoko whispers “Happy Christmas, Kyoko” (to her daughter) and John whispers “Happy Christmas, Julian” to his son. These whispers have been mistakenly credited as “Happy Christmas, Yoko” and “Happy Christmas, John” by incorrect sources. The song was originally released by Apple Records on green vinyl in December of 1971. Yoko’s “Listen, the Snow is Falling” was its B-side. Probably released too late to gain any traction, the song failed to chart on the Billboard Hot Singles chart in the US in 1971. It wasn’t released in the UK at all that year. It did reach #3 on Billboard’s Christmas singles chart. It hit #36 on the Cash Box Top 100 singles chart. It was to peak at #4 the next year in the UK. After John Lennon’s tragic death in December of 1980, the song was re-released and almost went to #1 on the UK charts (it crested at #2, behind “There’s No One Quite LIke Grandma” by the St Winifred’s School Choir). Never one to shy away from “borrowing” and being influenced by other sources, John Lennon was also very honest and forthright about admitting such. Possible influences on “Happy Xmas (War is Over)” include Phil Och’s 1968 song “The War is Over.” John also may have been inspired by the Doors’ 1968 song “The Unknown Soldier,” in which Jim Morrison cried out at the end “War of Over!” Also, Sly and the Family Stone’s 1968 song “Everyday People” may have given John the “white, black, yellow, and red” folks line. 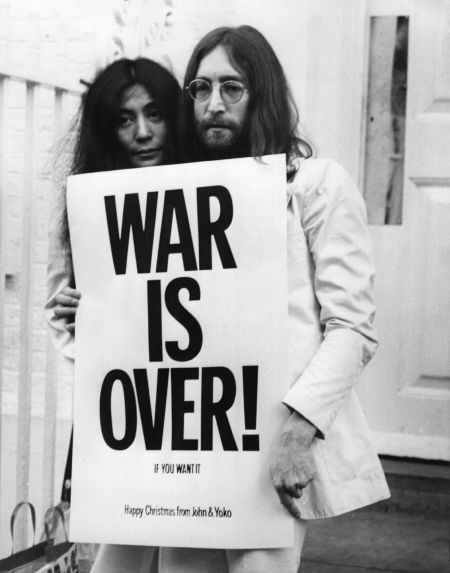 Although the song is overtly political, it is not usually though of as a “political song.” Rather, like another of John’s political manifestos “Imagine,” recorded that same year, “Happy Xmas (War is Over” has remained a Christmas holiday standard for forty years and is still going strong.